Monsters all look different. Some have four legs and one eye, others have six feet and eight hands ! But underneath, they are all the same. 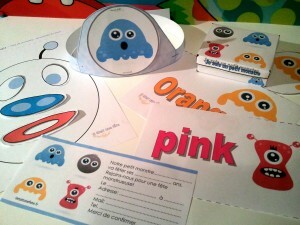 Within this party kit children are first required to make a monster with the « Stick the face on the monster game », where each monster will be totally different and very silly ! 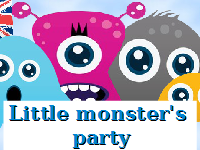 Then they are welcomed into the world of Little Monster, where they experience his first day at school, the difference between the other monsters and how this doesn’t matter when making friends. Plus, just as monsters look different they surely speak different ! So the children will also experience another language, Spanish, which is highlighted in two great games: the energetic ‘Spanish colour game’, and the final ‘number monsters hunt’ to find their candy boxes. Guaranteed that all the children will leave with a monster crown, candy box, monster photo frame, several words in spanish and a smile ! Would you like to buy this kit for your birthday party ? by PRESSING THE GREEN BUTTON BELOW, and you will be able to print off all the documents in the kit.